Your search for some transparent and strong 3D printing filaments to create any prototype or model, ends at Taulman 3D filaments. Taulman is committed to apply innovation and engineering to create filaments, which define the industry standard in the field of 3D printing material. If your business involves the use of high end 3D printers for various development processes then you need some specially designed filaments. Your need for such versatile filaments is taken care by Taulman. 3D printing is less of a process and more of an endeavor to create real life models, prototypes and parts. Such accurately printed components and parts will refine the manufacturing processes of companies, which spend a lot on research and development of new and effective techniques. The brittleness of filaments is a great inhibiting factor in creating flexible and accurate prints. The research undertaken at Tualman ensures that the Taulman nylon filaments gives the required rigidity and pliability to your printing tasks. For our Top 5 Filaments Pick click here. Extrusion of Nylon filaments is not as easy as that of the ABS and PLA filaments. But at Taulman this limitation of nylon filaments at the extruder was overcome by defining out the right chemical combination of filament material. This technical enhancement adds strength and durability to any part, printed with this advanced filament. Whether you print for your industrial customers or print for your own enjoyment and domestic needs, will always offer you the best. The quick printing capabilities of Taulman filaments have made them the most sought after raw material for 3D printers. With these filaments, you have the freedom to print some of the actual components of a major equipment. You can also print a few just-in-time machine parts to analyze the working and capability of an initial design. The filament is compatible with any kind of printers that are being used in the 3D printing industry today. 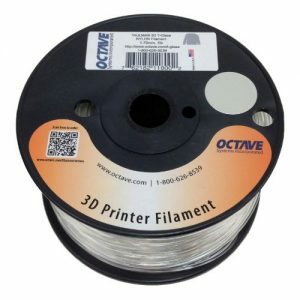 So before using this reliable filaments in your printing projects, here we have an overview of the best and most bought filaments from Taulman. If you have been working with an Afinia or Up! 3D printers and tried to print with nylon filament, you know what happens. The prints are warped and brittle. Irrespective of whether you have used a glass setup or the garolite plate. After fiddling with other materials you will get the support of nylon by Taulman. With amazing print results, you will never buy any other than made by Taulman. Here are the reasons for such drastic shift in preference. The most important reason for the successful printing is that Taulman has specially engineered these filaments to print on Afinia or Up! 3D printers. It provides flexibility of 8 possible preset temperatures to be selected from the range of 209°C and 266° C.
Like all the Taulman Filaments this co-polymer Nylon 3D printing filament also rates high on quality, strength, durability and ease of printing. If you use this material for a .35mm thick layer can be created by setting the speed of printing to normal, similar to ABS software setting. The great bonding between layers gives you the finest parts for your projects. One limitation is that the prints shrink by 1.7%, so you must make the design and setting adjustments beforehand to get the correct dimensions of your final product. If your printing project demands Nylon prints, then you can go ahead and get it. But make sure that the print tasks are not very complicated and well written switch instructions are provided. It is quite good if you print on the garalite after a bit of sanding. It is strong and flexible filament which ensures to give you some great prints for uncomplicated components. It may seem to be a bit difficult to handle, but after a trial or two, you will get the desired results. Over 75% Amazon buyers have appreciated it because of its fine printing capability and precision required on part dimensions. If you have to supply some high precision and sturdy parts for different equipment, then you must use this co-polymer roll. For all your printing tasks, which must give the final output in bright white, you can rely on theTaulman 618 Nylon. Due to its strength, durability by transparent nylon co-polymer filament, your prints can be a good competition to any other filament prints. If you want to give some color to the prints, you can do so on the translucent surface, using common clothing dyes available. The Taulman 618 nylon filament works very well with most of the commercial 3D printers available today. These filaments are adaptable to any kind of printing table, whether metallic or glass since it does not stick to any surface. The print comes out easily without any kind of damage to the print base. Its extrusion is flawless at the recommended temperature. 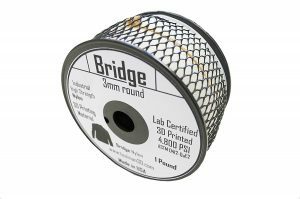 Available in 1 pound spools, and its secure packing, makes this filament convenient to feed and print. You don’t have to locate the leading end, it is secured externally in the package tab, for easy installation. At a 245°C temperature of the extruder, this filament attains best bonding possible in 3D prints. The great bonding comes with a super smooth surface and flawless finish. 618 nylon prints are distinctively noticeable among other print tasks due to their high class presentation and sturdy surface by this filament 3d printer. Sometimes you may get some filaments, which emanate harmful and foul smelling fumes. The nylon ink is guaranteed to give perfect printing without any odors or vapors. So you can spend any amount of time in your printing workshop. The filament is made from strong nylon co-polymer. Due to this the parts that you are going to print will be safe to be used with oils, acetone, alcohols, MEK resins, most alkalines, most 2 part casting compounds. The Taulman 618 nylon filament has a translucent bright white shade. So you can use any clothing dye to get a color of your choice. It is far more economical and convenient than the expensive colored filaments. 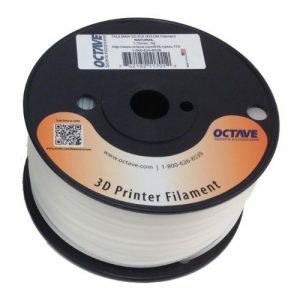 These 3d printing materials (filaments) work well with almost all printers except when printing with the Afinia and Up! Printers. If these printers, have an Octave Extruder Nozzle Temperature Switch set at a nominal, low temperature, then print will come out without burn marks. Good for any printing plate, but works best on a Garolite print plate to get perfectly shaped models without any hint of warp. If you do not pack the roll carefully in a proper bag, it may absorb moisture and becomes too brittle to extrude from the nozzle. Looking at the quality of this transparent filament 76% of the amazon buyers have rated it as an excellent 3D printing material. The stuff created with it is really very strong and dent-free. Clean prints which can be colored with the commonly available dyes, is one of the advantages you will get. So, you don’t have to spend a fortune on expensive colored filaments. And you will get the desired color in the prints. You must print the next batch of parts with this filament even if you are making them for some high-end machine like a racing car. You will be more than satisfied with reliable and tough results the parts will give. Want to create some amazing diffusers for LED lighting fixtures and flashlights? Want to pour your creativity in making some strong and safe kitchen bowls or plates at home? GetTaulman 3D T-Glase 1lb Spool and feed it to your 3D printer to realize these and many more bright ideas just as brilliant as you are. You will really be surprised with what other things you can do with this versatile PET filament. Here are some of the facts about Polyester Filament. 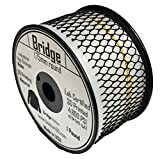 Whether you are bulk manufacturer or just an amateur artist, this filament, due to its strength is suitable for any kind of mass or small scale printing. It can extrude efficiently from large nozzles in an industrial unit or small nozzle of a 3D printer purchased to fulfill your artistic cravings on new materials. This one is not super flexible 3d printer filament. If you are unhappy with your decades old kitchen utensils, now you will be able make your own customized crockery or dinner set. The filament is made from PET which is approved by FDA for direct food contact/containers. So, create containers as per your kitchen specifications and demands. Taulman Filament can be reused if you are not satisfied with the earlier prints. This filament is compatible with struders that can convert the spoiled prints back into a usable line to be used in reprinting of a part. 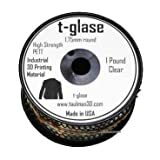 T-Glase shows very low shrinkage properties, so that if you need some large and flat prints, you can do so with least hassles. And kind of platform is not a limitation since it works nicely on acrylic, glass and other surfaces. If you are looking for 3d printer metal filament this one is not for you. You won’t get a single unpleasant whiff when you print with Taulman T-Glase. It does not emit any fumes, giving you an excellent 3D Printing Experience. This filament is a bit unpredictable unless you strictly follow the guidelines provided by the company. But you can still get a good clarity in prints after slight of fine tuning of nozzle temperature and the feed speed. At unsuitable settings you may get brittle prints with low layer adhesion. One pound spools are likely to be used up very quickly. This can be a major issue for those people who do a lot of printing jobs. If you are trying to print some very fine and precise parts, then you have to be extra careful while removing them from the printing surface. T-Glase Resin Filamentis outstanding when it comes to bridging. It gives a similar kind of bridging as you have with acrylics and polycarbonates 3D printing. 60 percent of the Amazon buyers exhibited their satisfaction with the capability, durability, ease of handling and clarity of prints with this economical 3D printing filament. It is good for any domestic or industrial printing job, since it can be reused with struders. So you can reprint if a part is not printed according to the specifications or is distorted while removing form print surface. If you want to print some clear, tensile and tough components, then this filament is a perfect choice for you.